Home › Pacific reef heron › Eurasian teal - Anas crecca. The Eurasian teal or common teal (Anas crecca) belongs to the family Anatidae. The Eurasian teal breeding population is distributed in temperate European and Asian regions. In the winter these teal species migrate to warmer southern Asia, Africa and North American coasts. There are two recognized Eurasian teal subspecies. The subspecies, A. c. crecca Linnaeus, 1758, breed in temperate European and Asian region, and winter in southern Europe, southern Asia and Africa. The subspecies, A. c. carolinensis J. F. Gmelin, 1789, breed in Arctic zone and winter in Canada, USA, Mexico and West Indies. The Eurasian teal is a small dabbling duck, males measuring 35 to 40 cm in length and weighing 250 to 450 grams. The wingspan is 58 to 64 cm. The female birds are smaller and weigh 200 to 400 grams. The male teals are very colorful in their breeding plumage. The body is pale grey. There is finely lined darker striations on the underside. The head is dark brick red with broad blue-green eye stripes lined with cream color. The chest patch is cream with fine black spots. The tail is black and white patterned and a yellow patch can be noticed. The Eurasian teal inhabit small lakes, lagoons, pools, slow flowing streams and marshes with abundant fringe vegetation. Wintering birds may be seen along the coast in brackish or saline lagoons, estuarine waters and sheltered coastal bays. The Eurasian teal species feed on aquatic plants, grasses, grain and cereals. The breeding birds may prefer molluscs, worms, fish fry, insects and crustaceans. The Eurasian teal breed during summer months (March-May) and egg laying commencing during April. For breeding they prefer shallow marshes with abundant emergent vegetation. They nest on the hollow in the ground hidden among vegetation. The Eurasian teal breeding population is distributed in temperate Eurasian regions. In the winter these teal species migrate to warmer Mediterranean, southern Asia, Africa and North American coasts. The northern breeding Eurasian teal populations are highly migratory. The populations in the temperate regions tend to be sedentary and may disperse locally. Post breeding, the migratory populations move southwards, the peak migration occurring between October and November. These birds return for breeding from February onwards and the peek migration occurring in March and April months. The Eurasian teal species have very large range and stable populations. Hence they may not be vulnerable in the near future. Conservation of the breeding and feeding grounds can help in continuation of population stability. The immediate threats are, hunting, lowland habitat loss and degradation, afforestation and land-use changes. 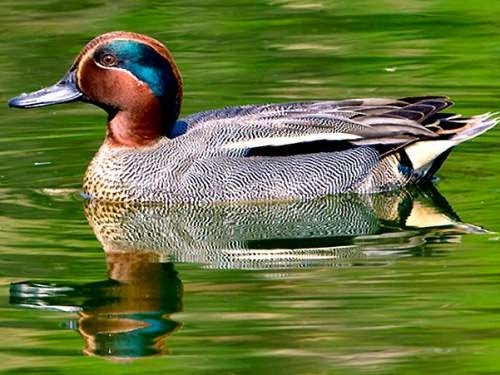 The IUCN (International Union for Conservation of Nature) has categorized and evaluated these teal species and has listed them as of "Least Concern". Current topic in Birds of India: Eurasian teal - Anas crecca.